ABC News & Diane Sawyer Easter Soup Nazis: No Guns For You! Tonight on ABC News’ “20/20,” the whole hour will be devoted to the topic, “If I Only Had a Gun.” You know, in honor of Easter Sunday. And as you can guess, host Diane Sawyer and the rest of the ABC News crew want you to know that if you only had a gun during a crime or a fatal murder, you would fail. Ever since last week’s shooting spree at the American Civic Association by Jiverly Wong, ABC has been madly promoting this “news” special to let you know that you shouldn’t own or try to use a gun because you would not only not kill criminals, but you would kill innocent bystanders and your kids would find your gun and kill other kids. Of course, the statistics and anecdotes say otherwise, but don’t let that get in the way of ABC News’ and Diane Sawyer’s anti-Second Amendment agenda. Um, Diane, last time I checked, police don’t go through years of magical teleporting and flying training so that like Superman and the men on the Starship Enterprise they can instantly be at every bank, every gas station, every dark, unlit parking lot instantly when a criminal threatens our lives. They’re reactive, and they won’t be there when someone tries to take my life or anyone else who doesn’t have a fancy chauffeur and fortress-like Manhattan apartment like Sawyer and her mega-rich Hollywood producer/director hubby have. The fact is, guns save lives and gun-owners have foiled criminals in so many instances. But you won’t hear about any of that, tonight, on ABC. Sawyer, in interviews, claims that this special is not about the Second Amendment, gun control, or whether or not Americans should own guns. But then she goes on to decry that applications for guns are way up and that Americans already own 250 million guns. Hmmm . . . sure sounds to me like that’s exactly what this is about. The applications for guns and the 250 million guns our there aren’t the problem. Those are the ones owned by law-abiding citizens, who applied to get them the legal way. Sawyer doesn’t mention a thing–and you can bet she won’t tonight–about the millions of illegally owned guns we face on a daily basis from criminals who wish us harm. But, hey, why try to defend ourselves against that, since in ABC News’ and Sawyer’s presentation, tonight, we would fail miserably? Why did ABC News and Diane Sawyer choose to do this full hour anti-gun show? She claims that we and police wanted us to do a set of experiments to find out what average people would do if they had a gun in a particular situation. Do you really think your average police department–big city or small–has nothing better to do and approached ABC and Diane Sawyer to find out if average people with guns will respond appropriately to criminals? The purpose of this show is a gun control agenda. You can tell that in none of their “experiments” does the “average citizen” gun-holder (who is probably not a trained gun-owner) succeed. And in all of their experiments, kids find guns and try to shoot each other. This isn’t a news show. It’s a Michael Moore style hour of pap, minus the humor and obnoxious edge. I’m glad this is airing on Good Friday, when hopefully most people will be away on a short vacation or spending time with their families on this religious weekend for Easter and Passover. Regardless of the ratings this show gets, one thing is for sure, ABC News and Diane Sawyer don’t want you to own guns. They don’t trust you, as if it’s they’re privilege to decide whether or not you can use one well enough. Yup, meet the new Soup Nazis of national broadcast TV News. Great! I just might watch it while cleaning and checking my S&W .45. The San Diego PD are the last ones I expect to come help me when some scum-bag could be trying to violate my living space or, G_d forbid, my daughters. Not on my watch! I be shootin’ first; figuring out what happened later. The destruction of the 2nd amendment is bound to come under KING HUSSEIN COBRAMA. The liberals are gearing up for an assault gun ban and these shows will soften up the masses. Hey Dianne, guns are banned in Mexico, how is that working? Oh yeah they want to ban it here to “fix” Mexico’s problem. It is so funny how the liberals love the Resistance movement in Mexico by the Zapatistas and oh yeah they are armed. Just like Castro and Che, liberals love the armed “resistance” of the left. So glamorized and justified. However, when it is conservatives who want to be armed well they can’t be armed. 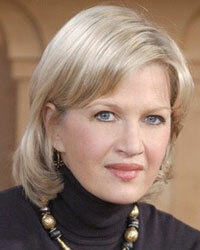 As for Dianne Sawyer I wish she would stop with her sultry voice thing. She still speaks with sappy breathy voice like it will seduce viewers. And she has a new boy toy in Robin Roberts. This special report will be the rallying cry for the communist democrats. See we told you so….American’s are just to stupid to own handguns and it’s our responsibilty to take them away from people because we must protect them from themselves. We’re from the government, and we are here to protect, err, dictate to you how you should live. Why does the MSM hate the Constitution so much? Can’t they see ALL our freedoms are joined at the hip? All will fall like dominos. Can we rename it “If I only had a Brain” or “If I only had a Father”. So my rights to own my gun is to be taken by a President who didn’t have a father and wants to pander to society’s most wretched because they didn’t have a Daddy? As for Nixon hiring Sawyer, he must have been in the delusional state. Diane had to have been Monica before Monica. “Why do I carry a gun? And there you have it. Sometimes people have to protect themselves. Let us not forget the primary reason for the Second Amendment. It is not about hunting, target shooting, collecting, or even stopping criminals, although all of those are fringe benefits. The Second Amendment guarantees our inalienable right to keep and bear arms so, if it becomes necessary, we will always have the practical means for violently overthrowing our own government. That is why private citizens are entitled to be as well armed as police and soldiers, for we may someday be forced to fight them. This is the price of liberty. I applaud Diane Sawyer for recommending that people with guns spend more time training to use them. Wish I had the time and the money for ammo. But her premise that guns afford their owners no protection is absurd. Many a homeowner has foiled a home invasion with a 12-gauge pump, and a lot of carjackings have been prevented by compact Kahrs. Glocks, and the like. If you own a gun, keep it secure and shoot often. Do people still watch TV “reports” anymore? If you don’t know by now that network TV is a cesspool of liberal ideology, there is NO hope for you. I doubt the prolific statistics that show average people defending themselves against crime with a gun will be presented. Idiots like Sawyer, who have 24/7 protection of some kind, are in no position to lecture anyone on how to defend themselves. I don’t own a gun, but if I lived in some of the Hell-holes called America’s Inner City, I would. And I would shoot first, second and third, and ask questions later! SERIOUSLY, NO KIDDING, I just got done cleaning my new DPMS Panther Arms AR-15 and my old 9mm Taurus I fixed myself. After a good day at the range with no jams and sighting in the new AR, it’s kind of funny to read this twisted stuff. I have personally pulled my gun more times than I can remember and have dealt with an angry Brindle Pit Bull, all successfully and in accordance with the law. Several of my friends have had close run ins with attempted car jackings and other bad guys up close and personal. Every time the only thing that kept them from being a statistic was the gun. PHOENIX – A Phoenix homeowner shot six times by Phoenix police officers has filed a claim against the city. Tony Arambula is seeking $5.75 million in damages for himself and his family after he was shot on Sept. 17 after officers responded to a call about an intruder inside Arambula’s central Phoenix home. The claim, filed by Phoenix attorney Michael Manning on behalf of Arambula, names the city, its police department, the officer who shot Arambula and two other officers. Phoenix police declined to comment on the shooting or the pending claim. The night of the shooting, Arambula said an intruder had broken into his home. Arambula called 911 and told police he was holding the intruder at gunpoint. As officers arrived, Arambula’s wife Lesley said she told them her husband was inside the house holding a gun on the intruder. “I told them my husband was inside, he was the one with the gun,” she said Tuesday. The officers entered the house with a shout of “Police!” Almost immediately afterward, Phoenix police Officer Brian Lilly shot Arambula in the back. Three more shots were fired at Arambula, one hitting him in the arm. The claim said that when Arambula fell to the floor, Lilly shot him two more times. That’s when Arambula told Lilly he’d shot the wrong man. In his Internal Affairs interview, Lilly admitted firing at Arambula without any verbal warning, according to the claim. He shot 6 times, in a hallway and (luckily) only wounded the wrong man. Barney Fife with his one bullet could have done better. This homeowner is lucky to be alive because of this cops incompetence. Oh and the untrained by abc’s standards homeowner is the one who detained the burglar. There was another shooting in Phoenix, years ago (around 2000) where a cop car with two officers drove in to a gang ambush. A civilian in a pick up behind the cop car, jumped out and fired his own weapon at the gang bangers, ending the ambush. He saved those officers lives. He got an award and an officer organization even replaced his gun, since it was taken for evidence. Guns are tools, it is how the person uses that tool decides whether it is for good or evil. G-d created Man. Sam Colt made Man equal. It is better to have a gun and not need it, then to need it and not have it. 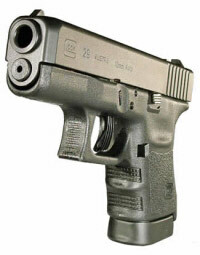 I think I’ll take my Glock .45 to the gun range Monday. And wear my NRA hat tomorrow while I run errands. I am SO glad to hear someone else say it. I do believe that one day millions of us and our military will join together to overthrow The Party and reestablish our freedoms. If they can’t trust me with a gun, that only effects the people with in a close proximity. How can they trust me with a Vote the effects every one in the Nation. Oh, wait, that’s what next after the guns go. they also interview another kid who killed his friend by accident and they ask him what he wants obama to do and he said “to take away all the guns” so all i have to say is, if you dont have one get one! if you have one, get your friend who doesnot have one! if not now when? I lasted about five minutes–when the Brady guy came on, I knew it was an advocacy piece. Guns are obviously serious business, but they give you a chance. You can’t very well call 911 when you’re holding the door against an intruder as I had to recently. Luckily he went away, but I’m considering a gun myself. YUP ! did you see the propaganda on Sixty Seconds on the Gun Shows ! The Globalist are in full swing to get rid of your guns that are bought legally! To take over this country! Did you know that if you were to purchase a gun you go through a extensive backround check that Barry . AKA , Obama , coke head did not go through to be nominated on the Democratic ticket to be President!